This GLUTEN FREE Banana Cake Recipe is a gorgeous one bowl cake. This cake is quick and easy to make as your food processor does all the hard work! When he said it several times, in between mouthfuls of cake, and then promptly put aside his empty plate informing me not to put it in the dishwasher because he was keeping it out to have more cake later, I knew he really liked it. Have you tried my Gluten Free Carrot Cake recipe? It’s good. Really good. What’s more, if you are on a gluten free diet this banana cake is a cake you can eat! Really good. 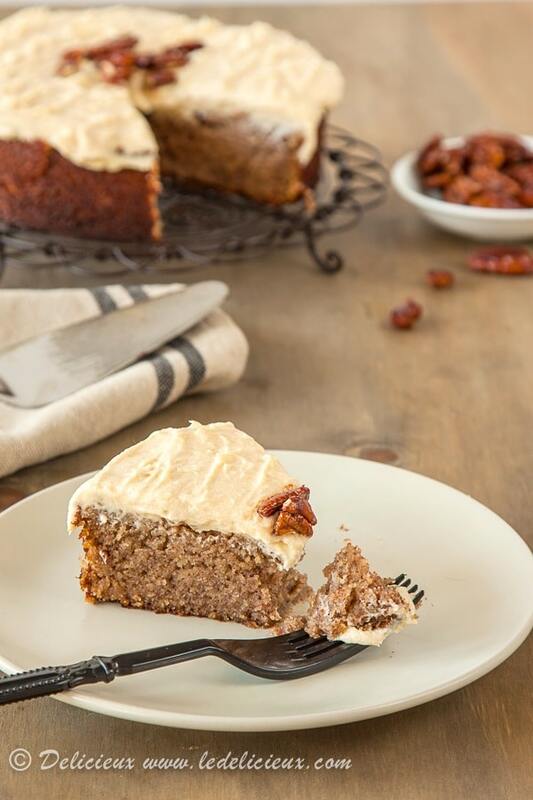 What’s more, if you are on a gluten free diet this banana cake is a cake you can eat! What’s more, if you are on a gluten free diet this banana cake is a cake you can eat! So what makes this recipe great? 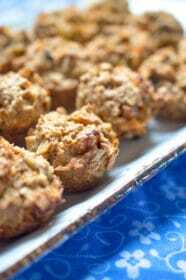 It is a fantastic way to use up an excess of bananas or overripe bananas. You only need one bowl! Your food processor does all the work. And it smells amazing while it is baking. 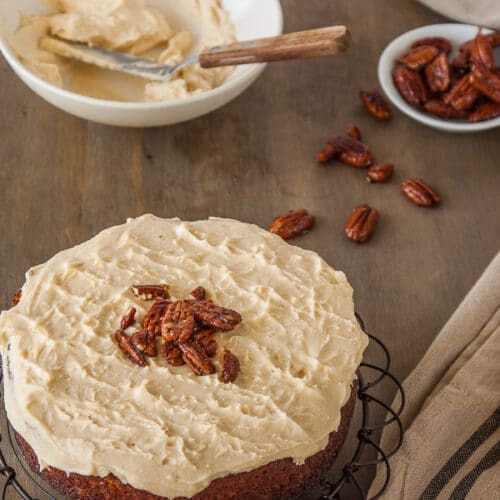 The finishing touch is a creamy cinnamon cream cheese frosting topped with salted honey roasted pecans. So if you have some overripe bananas sitting on your kitchen bench make this easy banana cake today! Grease a 20cm/7 inch springform pan and preheat the oven to 180 Celsius (350 Fahrenheit). Place the bananas in a food processor and process until smooth. Add the remaining cake ingredients and process to combine. 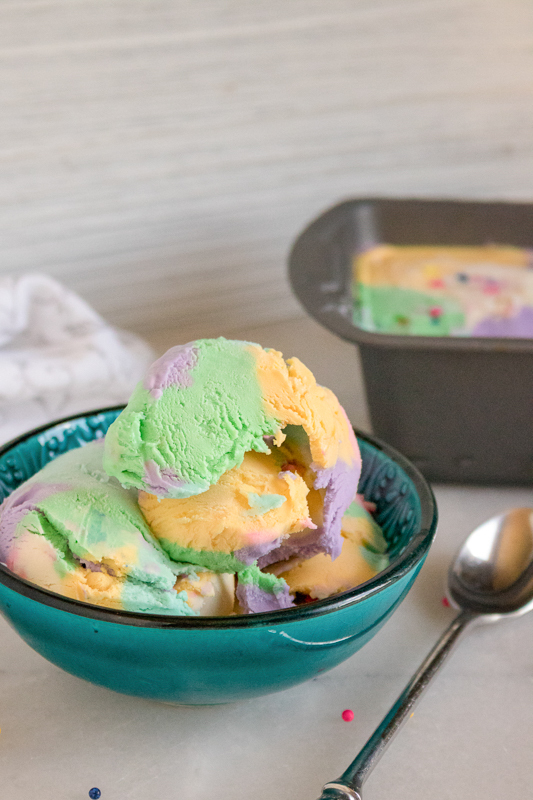 Pour the batter into the springform pan and bake for 40 minutes to 1 hour. Check the cake after 30 minutes as you may need to cover it with foil to prevent burning before the cake is cooked through. Remove from the oven and let the cake cool completely in the tin before removing. While the cake is cooling keep the oven on at 180 celsius (350 fahrenheit) and make the honey roasted pecans. Combine the pecans, honey, sea salt and boiling water in a bowl and mix to combine. Place on a tray lined with baking paper and bake for 15 minutes, stirring about half way through to make sure they are evenly cooked. Remove the tray from the oven and set aside to cool. 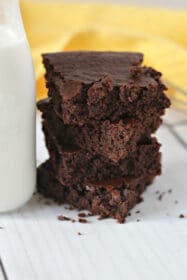 To make the frosting combine the butter and cream cheese in the bowl of an electric mixer fitted with a paddle attachment and beat until smooth and creamy. Add the icing sugar and cinnamon and beat for another 5 minutes, or until pale and fluffy. 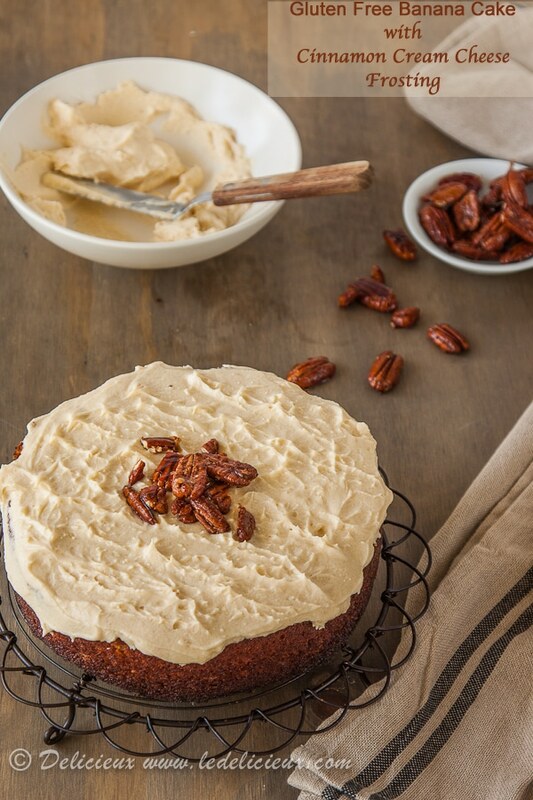 Spread the frosting over the cooled cake and top with chopped roasted pecans. Any left over pecans are wonderful with ice cream, in salads or simply on their own. Hi I was wondering if you could replace the sugar for honey? Thanks for the tips, I’ll let you know if it work out! Hi Jennifer, I used the tips you suggested and it worked great. I would probably decreases the honey to half a cup next time though as it was plenty sweet enough. Thanks for a great recipie! This one looks even better. The cream on top of it looks so delicious. The best ever banana cake which took 10 minutes to make in the Thermomix. Gluten free so perfect for family and friends on Easter Sunday who cannot have Wheat. The cream cheese icing with roasted pecans on top are delicious. This cake is amazing… Absolutely ‘the shiz’! Thank you… I think I will cut the sugar next time just because we eat very little sugar here, but delicious as written! Hi Katie, 😀 you can just replace the hazelnut flour with almond flour and it will be fine. Happy birthday to your son. I hope he loves the cake. I baked this cake yesterday, with half the sugar indicated. The end result was nice enough, to taste, if it was for family purposes, but the texture was not particularly good, with the top and sides tending to fall away. I couldn’t use it for guests without covering with the sweet icing and nuts but even them the cutting and eating texture is disappointing. Do you think the exact sugar is necessary to achieve a better result? Gluten-free choc almond meal cakes work out with a more dense texture. If I try again with all those expensive ingredients, I will mash the banana only, not mixing them to liquid state. May I ask, is butter or oil for the recipe ingredients missing? Sorry to hear that halving the sugar in the recipe the cake didn’t work out the way you had hoped. I’ve had lots of emails from people who have successfully made this cake with the full amount of sugar stated, who say that this is their favourite cake, so I suspect your suspicion is correct that reducing the sugar is to blame. By halving the sugar it does have an effect on the end result. You can learn a little more about the role of sugar in baking here. The sugar seems to help the cake caramelise on the edge providing stability. You could perhaps try reducing the sugar by maybe 1/4 or 1/3 but I can’t say how that would affect the end result not having tried it. In answer to your other question, no, there is no oil or butter in the recipe. The natural fats in the almond meal along with the eggs provide enough fat for the cake. I was a bit concerned when the mixture was a little more liquid than I’m used to, but what a gorgeous cake. Even my step son who is not a fan of Banana cake liked this one. I smeared the top with coconut butter instead of the icing. Also substituted hazelnut meal with some cornmeal flour. I’m so glad you enjoyed it Melanie 🙂 Thank you for taking time to leave feedback. Tried this cake recipe just now and it was amazing!!! No one would have guessed there was no flour, and no oil!! I stumbled across your website looking for gluten free banana cake recipes, so glad I did, I’ve bookmarked your website as it will be one of my favourites, at this stage I have seen a few recipes that I would like to try. Your recipes seem to be special not the norm. 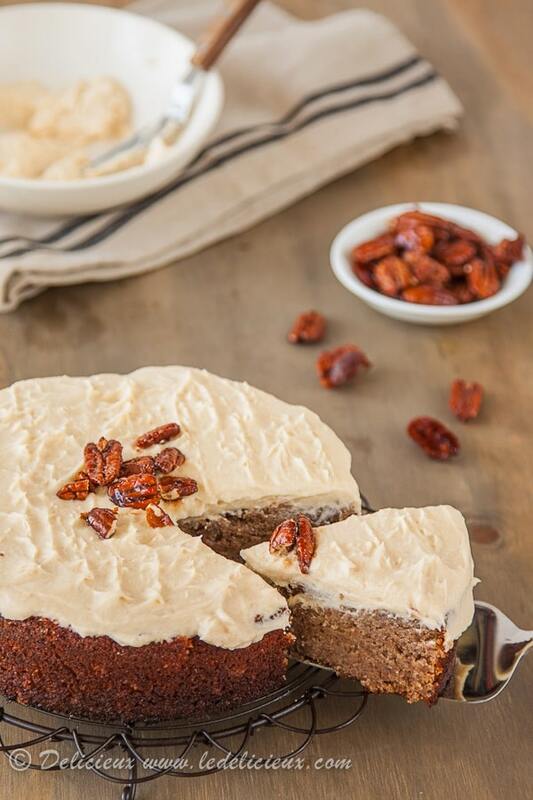 I made this gluten free banana cake with cinnamon frosting, I did not make the salted honey pecans this time. I just placed roasted hazelnuts on top. I used more bananas, maybe all up I used four and a half, I had to cut brown bits off. The recipe was easy to make I mixed it all by hand, used the electric chopper to mill my nuts. The cake was delicious and will be making it always. It was moist not sure if the extra bananas helped but I was really pleased with the results. I know many recipes that use the nuts as a flour base but I didn’t know how to change the recipe to make a banana cake, I guess I really didn’t think hard about it. 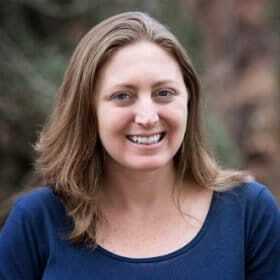 Thank you for a lovely website and all the delicious recipes within… I’m you new fan. I had lots of black bananas and was looking for a gluten free cake recipe to try. With my 19 month old granddaughter to help, we made this one and she has given it her seal of approval, dipping her hands in the mix to help fill the patty pans but somehow finding the way to her mouth instead. We made cupcakes and a cake (double quantity) and love the recipe. It is delicious! Hi Olivia, I’m so glad you enjoyed the cake, and that it’s a cake your whole family can enjoy. 🙂 It’s a definite favourite in our house. It also makes wonderful cupcakes too! I love banana desserts and your cake looks so moist. And the cream cheese frosting, even more delicious. You can never go wrong with a banana cake. Love em all! 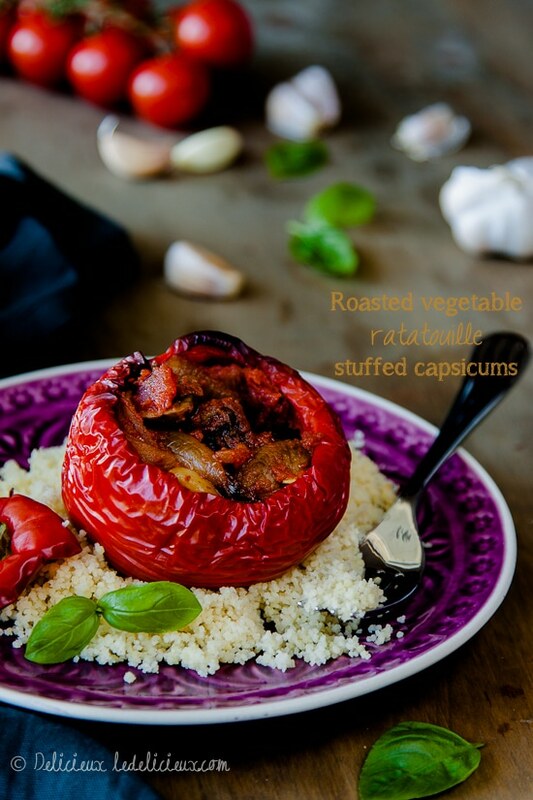 I’m new to reading your blog-love the photos, your writing and of course the recipes! 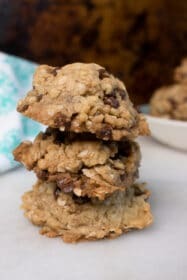 I’m a type two diabetic and would appreciate knowing (if you have it) the carbohydrate count for a piece of this delicious sounding recipe. Thanks so much, Jennifer. That helps alot! Oh Jen I can practically taste this jumping off the screen. We’re headed over to Perth this weekend to visit friends and I need a hostess gift to take. Do you think banana cake would be suitable? This sounds like such a delicious cake; I love using nuts rather than flour because it gives such a great texture and depth of flavour. This cake looks so wonderful! Mmm I just love baking with bananas.. I’ve taken to buying bananas weekly now so I always have a constant supply, heheh. 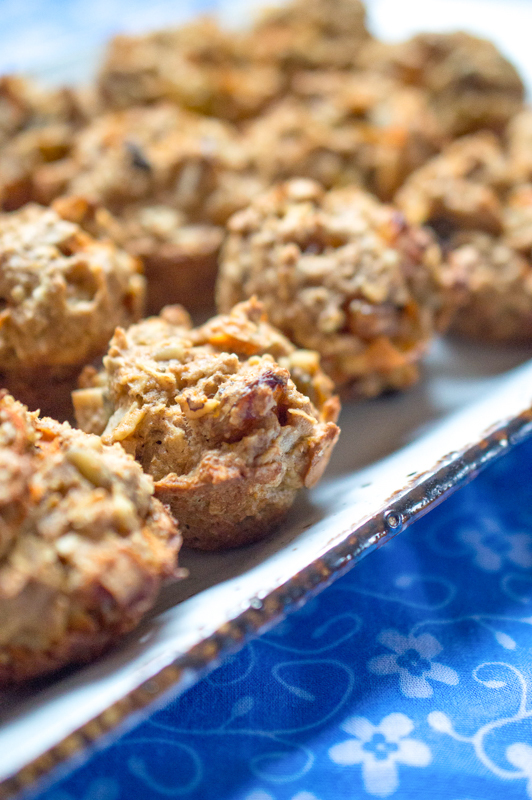 I haven’t tried baking with nut meals before but really would love to give it a try! I could eat handfuls of those salty honey roast peanuts alone… But I wouldn’t because I’d want to save room for this incredible cake! Looks absolutely wonderful Jennifer. I LOVE banana cake and that looks so amazing. May have to let those bananas get a little bit too over-ripe so I can make it. Looks great but do you think this cake could be made with different fruit? You could probably make it with raspberries or stewed apples. 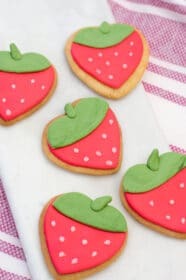 Keep the fruit quantity to around 300g and it should work ok. You may need to play with the sugar quantity though depending on how sweet the fruit is. I’ve been invited to a dinner party and I was asked to bring dessert. Two of the other guests must remain gluten free so this cake is perfect! I love the cinnamon icing. I love the idea of this flour-free cake, and banana cakes are the best. But I am trying to cut way back on my added sugar intake and was wondering if pureed dates could take the place of the sugar or is the sugar necessary for the chemical balance? I am not adverse to honey and that could be a good compromise. I think I would keep the banana and substitute it for the orange. Thanks for your help. What a great endorsement by Troy – so funny! Looks like a great cake and so simple too! Beautiful cake, I love the cinnamon cream cheese frosting! oh dear, I have a bunch of black bananas in my fruit bowl and now I’m just going to HAVE to make this, it sound deeelicious! The husbands approval is always a good sign! This cake looks sensational!!! 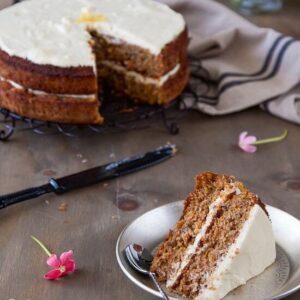 I love carrot cake and it always feels like you’re eating something that’s good for you even if it’s a little naughty. Sounds delicious, Jennifer, I adore a good carrot cake, especially with frosting! Hi Lizzy, sorry if you got the impression this is a carrot cake, because it’s actually a banana cake. Gah, sorry, I meant banana… I love them both! That cake looks moist and dangerously delicious!